Here, bioassays designed to monitor the development of a fungal pathogen, Colletotrichum fioriniae, in the presence of blueberry or cranberry floral extracts on glass coverslips are described. Water-, chloroform-, and field rainwater- based floral extraction techniques are detailed as well as insight into how this information can be applied. Waller, T. J., Gager, J. D., Oudemans, P. V. Colletotrichum fioriniae Development in Water and Chloroform-based Blueberry and Cranberry Floral Extracts. J. Vis. Exp. (146), e58880, doi:10.3791/58880 (2019). To accurately monitor the phenology of the bloom period and the temporal dynamics of floral chemical cues on fungal fruit rotting pathogens, floral extraction methods and coverslip bioassays were developed utilizing Colletotrichum fioriniae. In blueberry and cranberry, this pathogen is optimally controlled by applying fungicides during the bloom period because of the role flowers play in the initial stages of infection. The protocol detailed here describes how floral extracts (FE) were obtained using water-, chloroform-, and field rainwater-based methods for later use in corresponding glass coverslip bioassays. 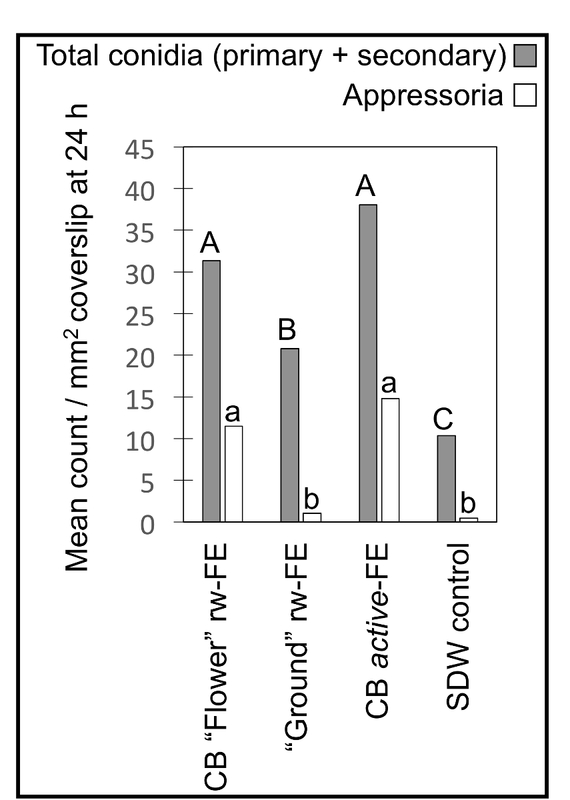 Each FE served to provide a different set of information: response of C. fioriniae to mobilized floral chemical cues in water (water-based), pathogen response to flower and fruit surface waxes (chloroform-based), and field-based monitoring of collected floral rainwater, moving in vitro observations to an agricultural setting. The FE is broadly described as either water- or chloroform-based, with an appropriate bioassay described to compensate for the inherent differences between these two materials. Rainwater that had run off flowers was collected in unique devices for each crop, alluding to the flexibility and application of this approach for other crop systems. The bioassays are quick, inexpensive, simple, and provide the ability to generate spatiotemporal and site-specific information about the presence of stimulatory floral compounds from various sources. This information will ultimately better inform disease management strategies, as FE decrease the time needed for infection to occur, thus providing insight into changing risks for pathogen infection over the growing season. Colletotrichum fioriniae causes a fruit rot of both Highbush Blueberry (Vaccinium corymbosum L.) and the large American Cranberry (V. macrocarpon Aiton)1,2. This pathogen was recently delineated from the C. acutatum species complex3,4,5,6 and is a causal agent of blueberry anthracnose and a member of the cranberry fruit rot complex, in addition to causing numerous other plant diseases worldwide7. C. fioriniae has a latent, hemibiotrophic lifestyle8, with infections occurring during bloom and symptom development not becoming apparent until the fruit are in final stages of maturation9. 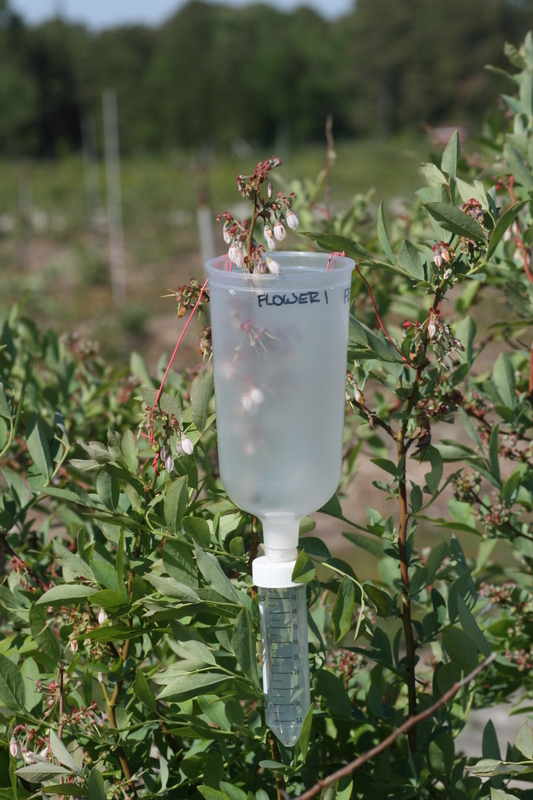 In blueberry and cranberry, fruit rot is only adequately controlled with fungicide applications made during the bloom period. The pathogen overwinters in dormant blueberry floral bud scales10 and sporulates during bloom. Conidia are moved throughout the canopy via rain-splash dispersal11,12 and inoculum buildup has been strongly correlated to the bloom period13. Response of Colletotrichum species to host flowers is not unique to Vaccinium, as flowers are important components of citrus post bloom fruit drop (PFD)14 as well as strawberry anthracnose15, in both cases causing the pathogen to sporulate. All of these cases highlight the need for effective methods to evaluate the temporal dynamics of floral chemical cues on C. fioriniae and other pathogens that infect during bloom. The insights provided by the methods described here are becoming increasingly more valuable. This protocol details methods of floral extract (FE) procurement and guides the evaluation of C. fioriniae responses to FE via glass coverslip bioassays15,16. The floral extraction techniques are broken into two main types; water-based extractions (active-FE, passive (pass-FE), and field rainwater-based (rw-FE)), and chloroform-based (ch-FE)17 extractions. The water-based extractions allow for inspection of water mobilized floral chemical cues. These mobilized cues are likely important components of the infection court, since FE greatly increases the speed of infection16, in addition to providing the moisture required for the infection to occur. Additionally, they represent a more natural condition as floral stimulation can be washed throughout the canopy during wetting-events as previously observed in blueberry and other crop systems14,16. Chloroform-based floral extractions (ch-FE) also provide valuable information pertaining to pathogen response to host surface waxes17,18, elucidating the early growth stages of conidia once deposited onto susceptible host organs (i.e. flowers, ovaries and developing fruit). Pathogen response to seasonal changes in host surface waxes can also be monitored using this protocol. Accordingly, the bioassays are tailored to working with either water-based FE or chloroform-based FE to mitigate the inherent differences between these two materials. The data generated from the bioassays revealed that water-based extractions stimulate higher levels of secondary conidiation than chloroform-based extractions where there was a definitive appressorial response, therefore implicating multiple compounds present in the FE. Interestingly, both of these growth responses were observed when using rainwater that had run off of blueberry and cranberry flowers, indicating multiple stimulatory compounds can be washed from the surface of flowers. Thus, monitoring for floral stimulation will provide insight into the probability of pathogen success in an agricultural system. The ultimate goal of this protocol is to provide a methodology for generating baseline biological information on fungal plant pathogens in response to floral chemical cues, as well as initiating methodologies that can utilize this floral information to aid in site-specific disease management and decision-making processes. Isolate Colletotrichum fioriniae from a naturally infected host19. Then, store the clean cultures on corn meal agar (CMA) slants. Place plug of culture (from CMA slant) onto a standard plastic cell culture dish (9 cm diameter) containing either clarified V8 juice agar (cV8A) (modified from Miller 1955), or non-clarified V8 juice agar (V8A)20. When colonies begin to sporulate, streak conidia (orange conidial masses) onto another cV8A or V8A containing cell culture dish (with a standard sterile loop) to produce a high-density sporulating culture. NOTE: Any protocol steps with fungi should be performed in a Laminar flow hood to reduce the possibility of contaminating fungal cultures and/or bioassays. After 7 days of growth, using a standard sterile loop gather a small amount of conidia from the high-density culture (by lightly touching the loop to the conidial mass) and stir this into a 15 mL centrifuge tube containing 10 mL of sterile deionized water (SDW). Vortex this sample for 10 s, then using a standard pipette plunge up and down numerous times to further mix the sample. Then, place a drop of the vortexed sample onto the hemocytometer and estimate spore concentrations. Count 5-10 fields on the hemocytometer, obtain the average, and multiply average by the appropriate dilution factor (i.e. 10,000), thus obtaining the conidial concentration per mL SDW. Then using a volume (V)/concentration (C) equation (V1●[C1]=V2●[C2]) adjust (with SDW) to 1.0 X 105 conidia per mL of SDW with a 5 mL final volume. This is referred to as the spore suspension and is only made immediately prior to use in either bioassay. Note: See Supplemental Figure 1, Supplemental Figure 2, Supplemental Figure 3, and Supplemental Movie 1. Carefully hand-collect blueberry (April-May) and cranberry (June-July) flowers during their respective peak blooms in the field (Supplemental Figure 1). Wear and change nitrile gloves between sampling locations (cultivars/varieties/physical locations) to inhibit human skin oil contamination as well as cross contamination between floral varieties. Place either blueberry or cranberry flowers (from a single source) into plastic bags (fill a 100 x 150 mm bag) and immediately refrigerate at 4 ° C once flowers are collected. NOTE: The active- extraction is modified from Leandro et al. (2003)16. Prior to extraction, remove any deteriorated, damaged, diseased flowers, then using healthy flowers remove the ovaries, sepals and peduncles with curved forceps (45˚ tweezers) and discard. Use only the remaining organs (corolla, stigma, style and stamen) for active- extractions. Cut cheesecloth (150 x 150 mm) and place within a 7 x 7 mm funnel, place into a clean 50 mL centrifuge tube, and set aside. Combine 1 part processed flowers to 9 parts SDW (1 wt: 9 vol ratio) in a mortar. Gently grind with a pestle for 30 s (take care to not completely pulverize the samples). Strain resulting pulp through prepared cheesecloth/funnel and collect in centrifuge tube (50 mL). Clean or use new mortar/pestle between each extraction with 95% EtOH and warm running water. Prepare a vacuum filtration apparatus: gather Buchner funnel, vacuum filter Erlenmeyer flask (up to 1,000 mL capacity), 55 mm circle filter paper, and vacuum hose/source. Add filter paper to an appropriate sized Buchner funnel and place atop the flask, then connect apparatus to a water/ suction source via vacuum hose and set aside. Further clarify the blueberry floral extracts by centrifuging for 10 min at 8,055 x g. Pour off supernatant into prepared vacuum filter apparatus, turn on vacuum source, filter supernatant, then pour flask contents into a new centrifuge tube (50 mL). Clean all apparatus components between each filtration with 95% EtOH and warm running water. Further filter through a syringe adapted with a 0.22 µm pore size, acetate sterilizing, filter into a new centrifuge tube (50 mL). For the cranberry floral extracts, only vacuum filter through filter paper and pour flask contents into a new centrifuge tube (50 mL). Resulting preparation is referred to as active- floral extract (active-FE). Store all water-based floral extracts (active-, passive-, rainwater collections) at -20° C in 5-50 mL aliquots until experimental use. Repeat extractions with multiple samples (at least 3 extractions per sample type) to provide replicates. Note: See Supplemental Movie 2. Hand collect whole blueberry flowers (50 g) as above, and refrigerate after collecting. Prior to extraction, remove any deteriorated, damaged, diseased flowers and remove only the peduncles from intact flower. Refrigerate prepared samples until the passive- extraction system, described below, is in place. Rinse all components prior to use with 95% ethanol (EtOH) and warm running water to prevent contamination (plastic mesh sheet, two plastic mesh baskets, glass bread pan, and pump mist bottle). Also prepare a 4 layer cheesecloth/funnel/50 mL centrifuge tube for each extraction as described above (in step 2.2), and set aside. Prepare the sieve: place a plastic mesh sheet (aka clear bar matting) into one plastic mesh basket (114 x 102 mm). Place a second, identical, mesh basket upside down (inverted) into a glass bread-pan (127 x 229 mm) (to avoid flowers sitting in SDW) and place the mesh sheet containing basket atop. Add 50 g of prepared flowers into the sieve. NOTE: Alternatively, small test tube [cleansing] baskets can be used in place of the originally used plastic mesh baskets (old, green, strawberry mesh pint baskets are often difficult to source). Evenly mist flowers with 250 mL using a pump mist bottle and capture runoff in the glass bread-pan. Then strain filtrate through the prepared cheesecloth/funnel into a clean centrifuge tube. Resulting preparation is referred to as passive- floral extract (pass-FE); store as per above (step 2.6). Clean all components between each extraction with 95% EtOH and warm running water. Repeat extractions with multiple samples to provide replicates (at least 3 per sample type). Collect blueberry and cranberry flowers as per above (step 2.1), and prepare flowers for extraction (step 2.2, without cheesecloth/funnel preparation). Keep prepared flowers refrigerated until prior to use. Any work performed with chloroform must be performed in a fume hood for safety reasons. This includes preparation of materials / glassware, extraction procedures, and bioassay conductance (steps using ch-FE). Clean all components with 95% EtOH twice, then twice with chloroform to prevent contamination for each extraction: threaded glass culture tubes, 2 glass beakers, small stainless steel screen, and a [glass] graduate cylinder. Set aside to dry upside-down. Rinse polytetrafluoroethylene (PTFE) lined caps twice with 95% EtOH only (chloroform will damage the outer materials of the cap) and set aside to dry. Combine 1 part processed flowers to 9 parts chloroform (1 wt: 9 vol ratio) in a beaker (flowers then chloroform), gently swirl for 30 s, and strain through a stainless steel screen into the second beaker. Pour ch-FE from the second beaker into the glass culture tube (10 - 15 mL) and affix the PTFE cap. Wrap the cap with parafilm to prevent evaporation. This preparation is the chloroform-based floral extract (ch-FE). Store sample in darkness (to reduce light degradation) at 4 ° C until experimental use. Repeat extractions with multiple samples to provide replicates (at least 3 per sample type). NOTE: The blueberry floral rainwater collection device consists of an air spray gun disposable paint spray cup with connection adapter (cup: female thread, adapter: male to male thread), 50 mL centrifuge tubes (polypropylene), parafilm, and plastic coated wires (standard telephone wire, individual internal wire strand contents). Select multiple locations within a blueberry bush to capture rainwater run off of flowers prior to creating collection devices. These include directly under inflorescences (flower) to the very base of the bush (crown). Record diameter of the stems (ranging from 1-5 cm) at selected locations, as this will dictate the size of holes used for device attachment, described below. For each selected location create a collection device. First drill a hole at the bottom of a spray cup (where the cup curves towards the threaded opening) to the corresponding stem diameter, with a step-bit attached to a drill press. Then, cut a straight line from the top of thehole to the mouth of the spray cup. Drill 4 equidistant holes (large enough to thread the plastic coated wire), at the mouth of the spray cup, and attach one end of the plastic coated wires leaving one end free. Drill a hole large enough to thread the paint sprayer cup adapter into a 50 mL centrifuge cap lid. Seal adapter threads with parafilm to prevent leaking. Attach this to both the centrifuge cap and threaded portion of the sprayer cup. Attach the mated 50 mL centrifuge tube. Repeat steps 5.3-5.4 to create multiple devices as per selected locations, a minimum of 4 collection devices per sampling location. Deploy devices at selected locations by flexing sprayer cups to fit onto stems. Orient the cut-side of the spray cup upwards using the plastic-coated wires attached to other stems (to insure water passing over flowers is captured). Affix parafilm any openings that could leak rainwater. (Supplemental Figure 3, Supplemental Figure 4, Supplemental Figure 5, and Supplemental Figure 6). Label collection tubes with deployment date / time. After a rain-event, remove and replace the bottom (tube) portion of the centrifuge tube (label date / time of collection). Bring runoff collections (referred to as blueberry rainwater floral extract (BB rw-FE)) inside and vacuum filter (filtration described in steps 2.4-2.5). Store as above (step 2.6), until used in a water-based bioassay. 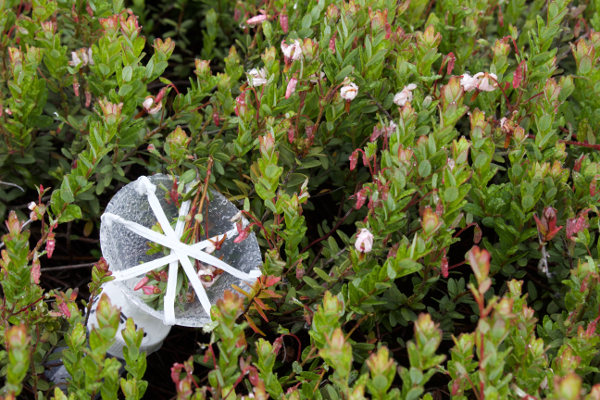 The floral rainwater collection device in cranberry consists of a 7 X 7 cm polypropylene funnel, 50 mL centrifuge tubes (polypropylene), parafilm, and 4 standard, plastic coated twist ties (per device). First, heat puncture 8 equidistant holes (diameter of twist ties) around the mouth of the funnel using a metal probe. Insert twist ties into 4 holes. Attach the other ends to that holes' opposite location, forming a neat crossing pattern. Wrap funnel down-stem with parafilm and set aside. Drill a hole large enough to insert the funnel down-stem into a 50 mL centrifuge cap with a step-bit. Insert prepared funnel into the centrifuge cap. Repeat steps 6.2-6.3 to create multiple devices, a minimum of 4 collection devices per sampling location. Deploy labeled (date/time) devices into selected cranberry bogs. Neatly tuck two flower bearing inflorescences (known as uprights) under the crossed plastic twist ties. Then vertically orient the device by piercing the centrifuge tube into the cranberry canopy (Supplemental Figures 7-8, Supplemental Movie 3). After rainfall or overhead irrigation remove and replace the bottom (tube) portion of the centrifuge tube (label date / time of collection). Bring runoff (referred to as cranberry rainwater floral extract (CB rw-FE)) inside and vacuum filter (filtration described in steps 2.4-2.5). Store as above (step 2.6), until used in a water-based bioassay. This bioassay is prepared in a Laminar flow hood. Prepare materials: triple rinse glass coverslips with 95% EtOH and air dry, then put aside. Cut paper towel disks to the internal diameter of a standard plastic cell culture dishes (9 cm). Place 2 layers of paper disks within culture dishes and soak with 2 mL SDW. Prepare at least 5 mL of a 1.0 X 105 conidia per mL of SDW spore suspension (C. fioriniae) as per above (step 1.2-1.4), set aside. Next, mix equal volumes of SDW and water-based floral extract in 2 mL microcentrifuge tubes. Then, add an equal volume of the spore suspension to the prepared 2 mL microcentrifuge tubes (SDW plus FE); the resulting preparation is referred to as an aqueous treatment mixture. For the control, omit FE portion and replace with SDW, to keep conidial concentrations consistent. NOTE: portion size is dependent on number of replicates and time-points. Typically, portions do not exceed 500 µL. Once conidia and FE are combined the bioassay has begun, 0 h post-inoculation. Place the pre-cleaned glass coverslips on top of the soaked paper towels within the cell culture dish. Place a 40 µL droplet of aqueous treatment mixture onto the center of a coverslip.Repeat for desired treatments, including the control, close the cell culture dish. Repeat in separate cell culture dishes for replications (at least 3) and time points (each dish is for 1 time point). Once all treatments and replicates have been dispensed, place all replicated cell culture dishes into a sealed plastic container (30 x 13 x 7 mm) and incubate at 25° C in the dark . At predetermined time-points, add 10 µL of a fixative like lactophenol cotton-blue (20.0 g phenol crystals, 20.0 mL 2.5% lactic acid, 40.0 mL glycerol, 0.05 g cotton blue) to the droplets, stopping growth and semi-preserving the mount. Wait 2 h to collect the 0 h time point as this allows conidial adhesion to the glass surface but is not long enough for conidial germination. For all other time points, add fixative at corresponding time. Once a fixative has been added, carefully invert the coverslips, placing them droplet side down on a glass microscope slide to facilitate microscopic examination (1 coverslip per slide). When all coverslips are on the glass microscope slides, leave them to settle and partially dry in the flow hood for 20 min. Count all conidia (total conidia) present on the coverslip (primary conidia, germinated conidia, and newly formed secondary conidia) as well as appressoria at either 400X magnification (counting 16 fields) or 200X (counting 4 fields), totaling an area of 3.808 mm2. Replicate entire bioassay for statistical analysis. For assays using water-based FE, analyze data as described in Waller et al. 201716, typically displaying as mean count/mm2 (total conidia or appressoria). Prepare materials and cell culture dishes as per above (steps 7.1). Additionally, rinse an equal number of Van Tieghem cells (VanT. cells) (8 mm OD, 6 mm ID) to coverslips, as well as a glass pipette (1 mL with 1 µl increments) within a fume hood, (twice with 95% EtOH then twice with chloroform), and set aside. 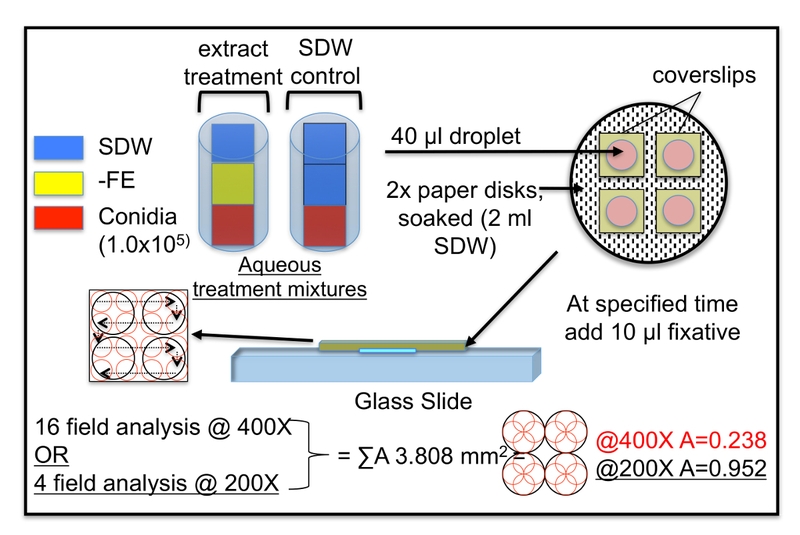 In laminar flow hood, using a 2 mL microcentrifuge tube add two equal volumes (at least 500 µL portions) of SDW and 1 volume of spore suspension, then set aside. This is the aqueous treatment mixture for ch-FE bioassays. In a fume hood, place a VanT. cell onto a glass coverslip within the prepared plastic cell culture dish. Dispense (with glass pipette) 33 µL of desired ch-FE into the center of the Van T. cell (do not touch the walls of the VanT. Cell; for the control treatment, add virgin chloroform), and allow to dry. Repeat in separate cell culture dishes for replications (at least 3). Once ch-FE has dried, dispense 99 µL of the prepared aqueous treatment mixture with a standard pipette into the center of the VanT. cell, then close all cell culture dishes. Once the aqueous treatment mixture has come in contact with the dried ch-FE treatments, the bioassay has begun, 0 h post-inoculation. Once all treatments and replicates have been dispensed, place all (closed) cell culture dishes into a sealed plastic container (30 x 13 x 7 mm) and incubate at 25° C in the dark. At predetermined time-points, add 15 µL of a fixative (lactophenol cotton-blue) to the VanT. cell and let sit for at least 5 min to insure adequate fungal staining. After that time, carefully remove the VanT. cell and follow coverslip inversion and data acquisition steps above (steps 7.5-7.6). For data analysis, follow methods described in Gager 201517, typically displaying data as appressorium formation, which is the ratio of total conidia to appressoria counted in the area observed (3.808 mm2). Hand collect cranberry flowers (in June; 100 g), immature fruit (twice; July and August; 200 g), and mature cranberry fruit at harvest (October; 200 g), place into appropriately sized plastic bags and refrigerate at 4 ° C immediately after collection. Use the contamination precautions outlined above (step 2.1). NOTE: There will be extra plant material collected at each time but these amounts guard against extracting obviously fungal infected ovaries and fruit (showing symptoms and signs of disease). Prior to extraction, remove any deteriorated, damaged, diseased flowers, then using only healthy flowers, remove the sepals, peduncles, corollas, stigmas, styles and stamens with curved forceps (45 ° tweezers) and discard all but the ovaries. Once ovaries are collected, perform the chloroform-based extraction at a 1 wt: 9 vol ratio (detailed in steps 4.2-4.4, using only ovaries). Store samples until all other extractions are complete, i.e. until bioassay conductance. Once fruit are collected, perform a chloroform-based extraction (steps 4.2-4.4, using collected fruit instead of flowers), but add 10 g of fruit to 90 mL of chloroform and once extracted, allow the solution to evaporate to 9 mL (resulting in a 10 g: 9 mL wt: vol solution). Make fruit extractions immediately after collecting in July, August, and October. Store as per above (step 4.4) until all extractions are collected. After the last chloroform-based fruit extraction, subject all penology-based chloroform extracts collected for this assay to the chloroform-based bioassay and analyze accordingly (steps 8.1-8.6). The results presented here are a few examples of the many assays that can be performed using this methodology. Figure 1 is an illustrated guide to the water-based FE bioassay, and is supplemented by Figure 2 which follows on to the chloroform-based FE bioassay. Figure 3 provides a visual guide to what can be expected upon microscopic evaluation of C. fioriniae at 24 h, in both water- and chloroform-based bioassays (compared SDW controls). Figure 4 details a 24 h time-course study with C. fioriniae in the presence of the cranberry variety 'Stevens' ch-FE, and gives visual reference to an import result of this research: FE decreased the time needed to form infection structures compared to SDW. Figure 5 provides an example of data collected from a coverslip bioassay using cranberry floral rainwater runoff (CB "Flower" rw-FE). Figure 6 represents another important result: floral ovary ch-FE was much more stimulatory than fruit ch-FE, indicating the importance of bloom in the lifecycle of C. fioriniae. The supplemental photos and movies provide important visuals of the flowers used in the extractions and floral rainwater collection devices/deployment, in addition to movies that visualize the active- and passive- extraction (water-based) processes. Figure 1: General overview of the water-based floral extract (FE) bioassay. This assay was utilized for water-based floral extracts with both blueberry and cranberry flowers: active-floral extracts (active-FE), passive-floral extracts (pass-FE) and floral rainwater runoff (rw-FE). The -FE portion typically constitutes the experimental/variable factor. Conversely the -FE portion can remain constant and time points/hours post-inoculation can be evaluated. Preference has been made towards 4 field analysis at 200X magnification. Abbreviations: Sterile deionized water, SDW; Area per field of view, A. Please click here to view a larger version of this figure. Figure 2: General overview of the chloroform-based floral extract (ch-FE) bioassay. This assay was utilized for both blueberry and cranberry (flowers, ovaries and fruit). 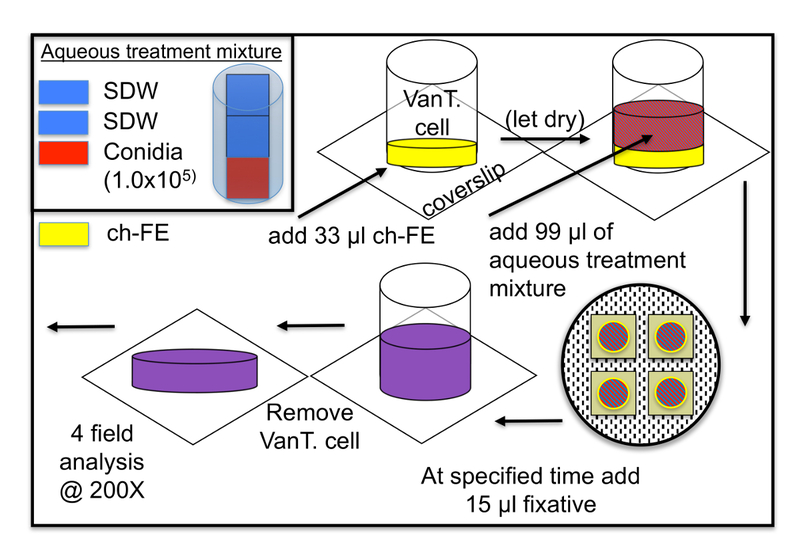 Only one type of aqueous treatment mixture was used in this assay, 1 part spore suspension to 2 parts SDW (to keep conidial concentration consistent due to ch-FE evaporation). This assay can be used to compare multiple ch-FE (waxes from various plant surfaces), or multiple time points/hours post-inoculation using a single ch-FE. Abbreviations: Sterile deionized water, SDW; Van Tieghem [glass] cells, VanT. cell. Please click here to view a larger version of this figure. Figure 3: Visual comparison of Colletotrichum fioriniae in the presence of water-based FE and ch-FE. In this assay blueberry 'Bluecrop' (active-FE, water-based) (fungal isolate: BB#10) and cranberry 'Stevens' chloroform-based (ch-FE) (fungal isolate: CB-PMAP182) floral extracts were compared to SDW controls. 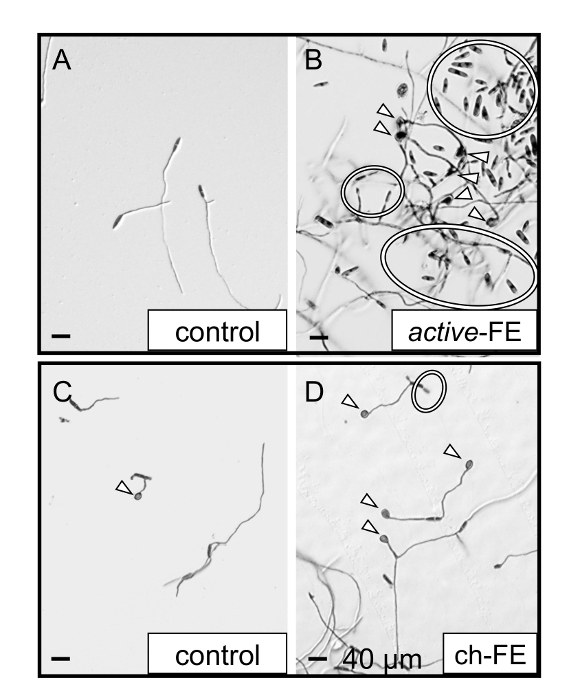 A dramatic increase in secondary conidiation (rings) and appressorium formation (arrowheads) were observed when comparing conidia in the presence of SDW (control) (A) to active-FE (B) at 24h post-inoculation. 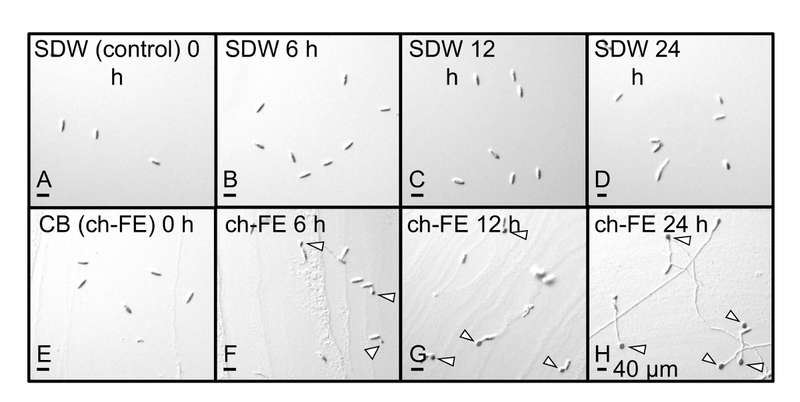 However, secondary conidiation was not as apparent when comparing the chloroform bioassay SDW control (C) to ch-FE (D); rather, C. fioriniae growth shifted towards appressorial formation. Shown is a common response to each extraction type, water-based and chloroform-based, regardless of host/floral species described. Please click here to view a larger version of this figure. Figure 4: Time-course study (24 h) with Colletotrichum fioriniae in the presence of ch-FE. In this assay, an SDW control (A-D) and cranberry 'Stevens' ch-FE (E-F) were visually inspected at 0, 6, 12, and 24 h post-inoculation (an example of variable time points instead of comparing multiple FE). Appressorium formation (arrowheads) began at 6 h in the ch-FE and steadily increased throughout subsequent time points. This results eludes to an important factor of pathogen biology during the bloom period: flowers reduce the time needed to form infection structures. Please click here to view a larger version of this figure. Figure 5: Graphical display of data collected using rw-FE in a bioassay. Rainwater run off of cranberry flowers (CB "Flower" rw-FE) and virgin rainwater that had not touched any cranberry plant tissues ("Ground" rw-FE) from a single wetting-event plus a standard active, cranberry water-based floral extract (CB active-FE) (positive control) and SDW (negative control) were subjected to a water-based coverslip bioassay and evaluated for C. fioriniae growth. 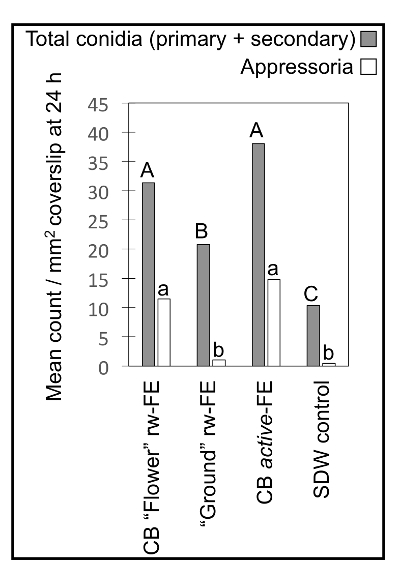 CB "Flower" rw-FE had the same level of secondary conidiation and appressorium formation as the standard CB active-FE at 24 h post-inoculation, indicating that the collection devices were effective in capturing floral stimulants released during a wetting-event. Total conidia is comprised of primary (deposited), conidia and newly formed secondary conidia. Letters indicate significant differences at p < 0.05 according to Fischer's Least Significant Difference test (LSD); uppercase, total conidia; lowercase, appressoria. Please click here to view a larger version of this figure. 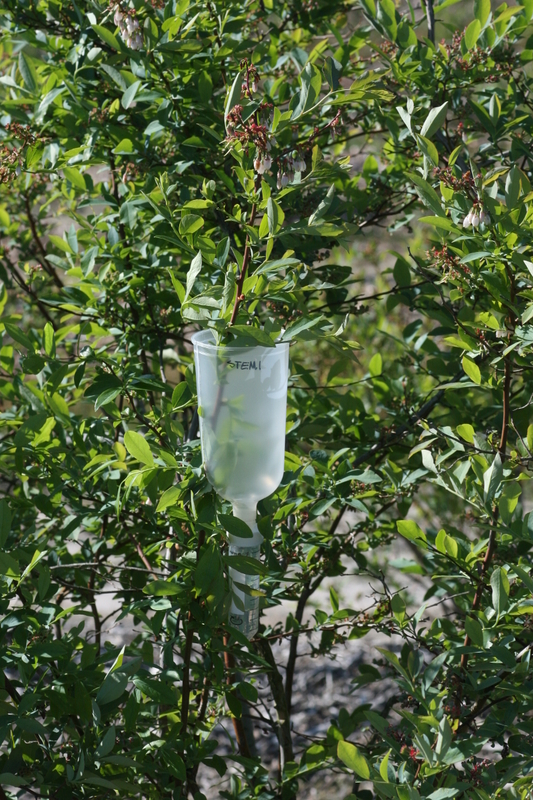 Figure 6: Cranberry phenology based ch-FE bioassay, visual inspection. Disease management for fruit rotting fungi often involves bloom time fungicide applications. Here, cranberry chloroform-based extracts (ch-FE) from multiple growth stages of cranberry ('Stevens') were visually evaluated for the effect of surface waxes on C. fioriniae at 24 h post-inoculation. Ovaries collected in June (A), immature fruit collected in July and August (B, C), harvested fruit collected in October (D), and an SDW control (E) were inspected for appressorial formation (arrowheads). Ovary ch-FE had the greatest magnitude of appressorial formation, indicating that this plant phenology (bloom) is critically important to the lifecycle of C. fioriniae. Please click here to view a larger version of this figure. Supplemental Figure 1: Blueberry inflorescence. 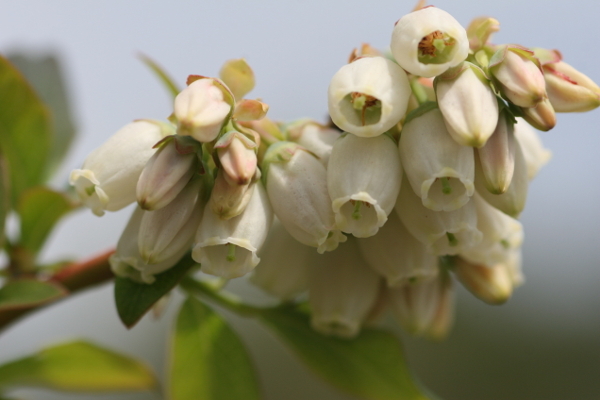 Blueberry flowers were collected for extractions during full bloom (April-May in New Jersey, USA) (shown 'Bluecrop'). Note the overlap of corollas/ovaries from adjacent flowers and the overall architecture of the inflorescence compared to Supplemental Figure 2 (cranberry upright). Please click here to view a larger version of this figure. Supplemental Figure 2: Cranberry upright. 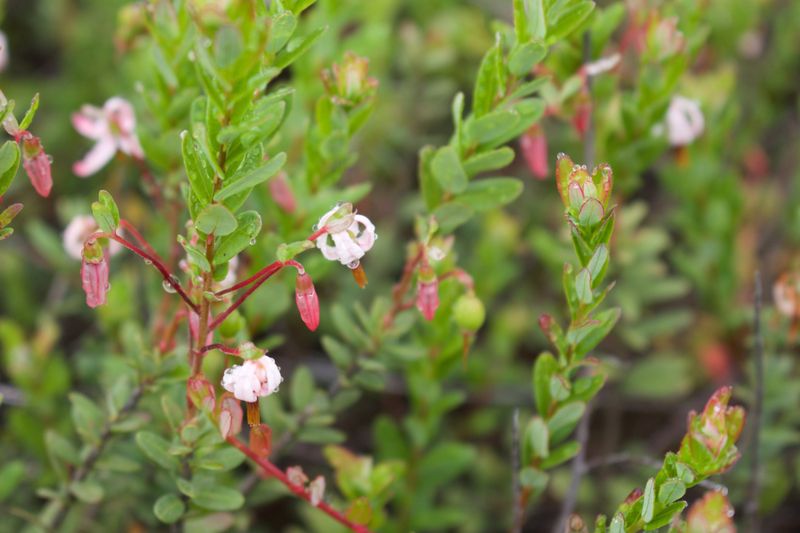 Cranberry flowers were collected for extractions during full bloom (June-July in New Jersey, USA) (shown 'Stevens'). Note the varied flower stages on a single cranberry inflorescence (upright), and the hooked, water droplet retaining the shape of the corolla. Please click here to view a larger version of this figure. Supplemental Figure 3: Blueberry rainwater deployment (flower). Completed blueberry floral rainwater collection device, placed directly under a cluster of inflorescences. Note the plastic-coated wire used to vertically orient the device. Please click here to view a larger version of this figure. Supplemental Figure 4: Blueberry rainwater deployment (stem). Completed blueberry floral rainwater collection device, placed half way down the stem between an inflorescence and the crown of the bush. Please click here to view a larger version of this figure. Supplemental Figure 5: Blueberry rainwater deployment (crown). Completed blueberry floral rainwater collection device, placed at the base of the bush (crown). Note plastic coated wires can be removed if not necessary. Please click here to view a larger version of this figure. 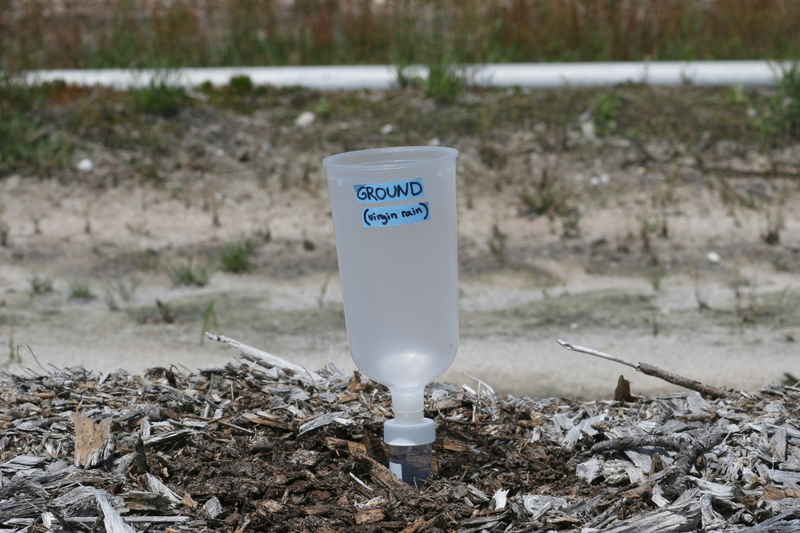 Supplemental Figure 6: Blueberry rainwater deployment (ground). Completed virgin rainwater collection device, placed adjacent to blueberry bushes. Please click here to view a larger version of this figure. Supplemental Figure 7: Cranberry rainwater deployment (close-up). Completed cranberry floral rainwater collection device, with two uprights tucked under the neatly crossed wire ties. Please click here to view a larger version of this figure. Supplemental Figure 8: Cranberry rainwater deployment. 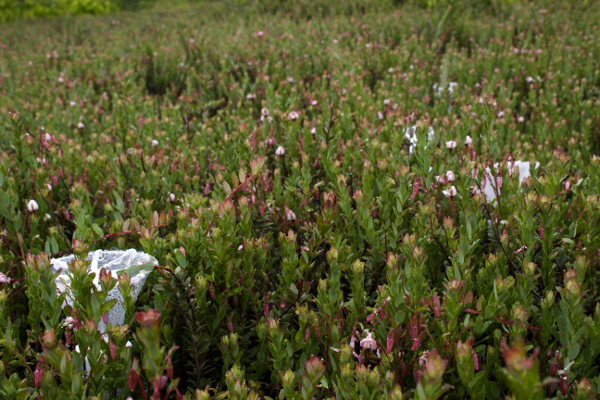 Multiple completed cranberry floral rainwater devices deployed in a bog. Please click here to view a larger version of this figure. The bioassays detecting the C. fioriniae response to floral extracts (FEs) were developed for the blueberry and cranberry fruit rot pathosystems but can be readily adapted to other horticultural crops. The protocol detailed above has been valuable in acquiring many important data sets including, but not limited to: FE effects on multiple isolates of numerous pathogens, time-course information pertaining to fungal growth stages in the presence of various FEs, comparison of extraction techniques, inspection of individual chemicals on C. fioriniae growth and differentiation, evaluation of individual flower organ extracts, effects of temperature on C. fioriniae while in the presence of FE, effects of phenology dependent wax extractions, and floral rainwater effects. Through the use of these techniques, data generated has also provided a much clearer understanding of C. fioriniae life stages and partially elucidates why the bloom period is so critical to the control of many fruit rotting pathogens. Initially, all flowers were processed identically to the active-FE, but the extraction process has moved towards using whole flowers. Floral dissection was time consuming and had very little effect on the bioactivity of the resulting FEs. However, individual floral organs can and have been evaluated using this protocol, but great care must be taken to not completely macerate the floral tissues (Supplemental Movie 1, with precautions detailed in step 2.3), as this may result in released fungi-toxic/static compounds into the FE that could distort the microscopic evaluations. Less invasive extractions such as pass-FE (Supplemental Movie 2) and rw-FE are now more favorable due to their ease of acquisition. Additionally, these extraction techniques require only vacuum filtration to acquire biologically active floral chemical cues. The flowers utilized in all extractions were typically refrigerated for 0-3 days prior to extract preparation. A challenge of this protocol is time management of FE turnover (field collection through storage of extracts). This was exacerbated by numerous samples from multiple sources and dates. Frozen flowers have not been evaluated to any real extent, as thawed flowers appear deteriorated and discolored. However, once the water-based FEs have been prepared, repeated freezing and thawing has shown no effect on the bioactivity of the FE, so as long as the FE are quickly refrozen after bioassay preparation (viable 3 year old FE). Chloroform-based extraction enables the investigation of pathogen responses to three-dimensional floral/fruit surface waxes in a two-dimensional plane via ch-FE evaporation on glass coverslips. However, it is unlikely that the actual crystalline structures of waxes deposited from the ch-FE are identical to the surface from which they were collected. 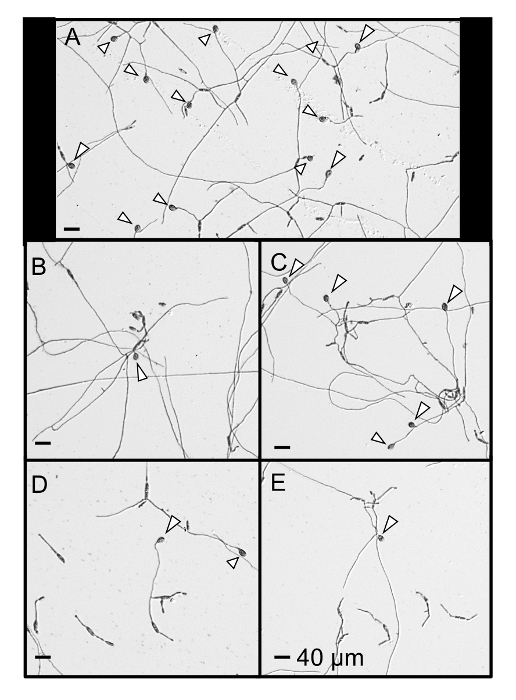 Meaning, supplemental techniques should be implemented if fungal response to specific wax structures in vivo are the main focus of investigation. Chloroform-based extracts need more storage maintenance than the water-based extractions. In addition to keeping the ch-FE extracts in the dark, the PTFE lined cell culture tube caps and parafilm sealing wrap need to be regularly checked for evaporative leaks and replaced as necessary. The concept of monitoring floral rainwater runoff is rooted in the idea of advancing site-specific disease monitoring tools. The rainwater collection devices can be adapted to many other plant architectures, so long as the collection device captures rainwater that has run off of flowers. This approach provides information on whether or not floral stimulation is present in the field at any given time and can be monitored throughout the season. 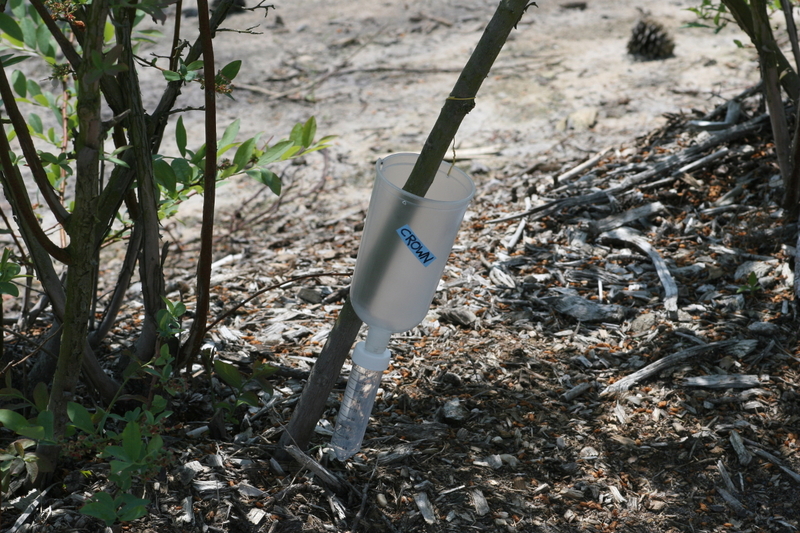 Alternatively, collection devices can be deployed at multiple canopy locations to determine how far floral cues have been washed during any given wetting-event. In future experiments, rw-FE will dictate when fungicide applications should begin and when they can safely end. Additionally, by monitoring phenology dependent wax extractions (protocol section 9), the importance of the bloom period to pathogen biology has become even more evident. That section was also included to demonstrate the flexibility of these bioassays, providing methods that allow for side-by-side comparison of host surface waxes that are temporally separated. The data generated using the floral extraction techniques and bioassays represent tangible indicators of pathogen stimulation, specific chemical classes important to pathogen biology, and targets for future control strategies. We thank the William S. Haines, Sr. Endowed Cranberry Research Fund and the New Jersey Blueberry and Cranberry Research Council, Inc. for support. We also thank Jennifer Vaiciunas (guidance and floral preparations), Christine Constantelos (fungal culture and floral preparations), David Jones (floral preparations and extractions), Langley Oudemans (floral preparations, filming/photography), Jesse Lynch (floral preparations), Roxanne Tumnalis (general support), and numerous student/summer interns. Pszczółkowska, A., Okorski, A. First report of anthracnose disease caused by Colletotrichum fioriniae on blueberry in western Poland. Plant Disease. 100, 2167 (2016). Oudemans, P. V., Caruso, F. L., Stretch, A. W. Cranberry fruit rot in the northeast: a complex disease. Plant Disease. 82, 1176-1184 (1998). Damm, U., Cannon, P. F., Woudenberg, J. H. C., Crous, P. W. The Colletotrichum acutatum species complex. Studies in Mycology. 73, 37-113 (2012). Marcelino, J., Giordano, R., Gouli, S., Gouli, V., Parker, B. L., Skinner, M., TeBeest, D., Cesnik, R. Colletotrichum acutatum var. fioriniae (teleomorph: Glomerella acutata var. flioriniae var. nov.) infection of a scale insect. Mycologia. 100, 353-374 (2008). Pennycook, S. R. Colletotrichum fioriniae comb. & stat. nov., resolving a nomenclatural muddle. Mycotaxon. 132, 149-154 (2017). Shivas, R. G., Tan, Y. P. A taxonomic re-assessment of Colletotrichum acutatum, introducing C. fioriniae comb. et stat. nov and C. simmondsii sp nov. Fungal Diversity. 39, 111-122 (2009). Wharton, P. S., Diéguez-Uribeondo, J. The biology of Colletotrichum acutatum. Anales del Jardín Botánico de Madrid. 61, 3-22 (2004). Prusky, D., Alkan, N., Mengiste, T., Fluhr, R. Quiescent and necrotrophic lifestyle choice during postharvest disease development. Annual Review of Phytopathology. 51, 155-176 (2013). Milholland, R. D. Compendium of Blueberry and Cranberry Diseases. American Phytopathological Society. St. Paul, MN. (1995). DeMarsay, A. Anthracnose fruit rot of highbush blueberry: biology and epidemiology. Rutgers University. New Brunswick, NJ. Dissertation (2005). Madden, L. V., Yang, X. S., Wilson, L. L. Effects of rain intensity on splash dispersal of Colletotrichum acutatum. Phytopathology. 86, 864-874 (1996). Yang, X., Madden, L. V., Wilson, L. L., Ellis, M. A. Effects of surface-topography and rain intensity on splash dispersal of Colletotrichum acutatum. Phytopathology. 80, 1115-1120 (1990). Wharton, P. S., Dickman, J. S., Schilder, A. M. C. Timing of spore release by Colletotrichum acutatum in Michigan blueberry fields. Phytopathology. 92, 86 (2002). MacKenzie, S. J., Peres, N. A., Timmer, L. W. Colonization of citrus leaves and secondary conidiation response to citrus flower extracts by non-postbloom fruit drop strains of Colletotrichum acutatum. Tropical Plant Pathology. 35, 333-342 (2010). Leandro, L. F. S., Gleason, M. L., Nutter, F. W., Wegulo, S. N., Dixon, P. M. Strawberry plant extracts stimulate secondary conidiation by Colletotrichum acutatum on symptomless leaves. Phytopathology. 93, 1285-1291 (2003). Waller, T. J., Vaiciunas, J., Constantelos, C., Oudemans, P. V. Evidence the blueberry floral extracts influence secondary conidiation and appressorial formation of Colletotrichum fioriniae. Phytopathology. 108, 561-567 (2017). Gager, J. The influence of cranberry floral wax on appressorium formation in Colletotrichum fioriniae. Rutgers University. New Brunswick, NJ. Masters thesis (2015). Podila, G. K., Rogers, L. M., Kolattukudy, P. E. Chemical signals from avocado surface wax trigger germination and appressorium formation in Colletotrichum gloeosporioides. Plant Physiology. 103, 267-272 (1993). Polashock, J. J., Caruso, F. L., Oudemans, P. V., McManus, P. S., Crouch, J. A. The North American cranberry fruit rot fungal community: a systematic overview using morphological and phylogenetic affinities. Plant Pathology. 58, 1116-1127 (2009). Miller, P. M. V-8 juice agar as a general purpose medium for fungi and bacteria. Phytopathology. 45, 461-462 (1955).